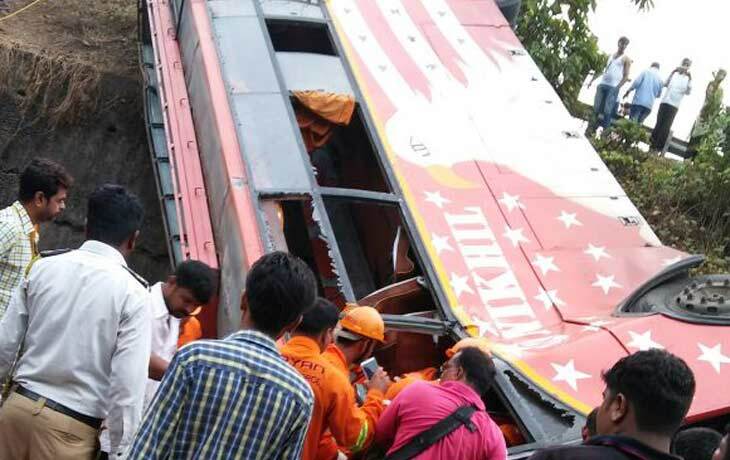 Mumbai-Pune Expressway Accident: 17 Dead, 33 Injured: As per the report, in this major accident, were 17 people killed and nearly 33 people injured when this luxury bus rammed into two cars in the Mumbai-Pune corridor expressway on this Sunday, (Dated: June 5, 2016). In that 17 dead, were 13 males and four females included. However, the Swift desire Car driver was changing their punctured tyre and another Innova Car stopped beside of that car to help him. When the bus coming from the Satara and collided with these two cars and fell down into a 20 feet ditch on the left side road. Where the injured people are immediately admitted to the nearest Panvel MGM hospital.